Topps has announced the redemption checklist for the 2011 Bowman Platinum USA Baseball Autographs. Among the players are several projected top picks in the 2012 MLB Draft, including Deven Marrero, Mark Appel, Michael Wacha and Kevin Gausman. 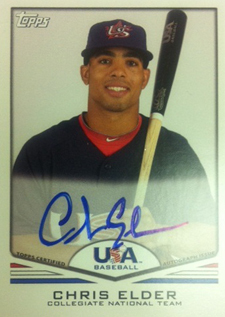 The cards feature all on-card signatures. Each 12-box case of 2011 Bowman Platinum Baseball is guaranteed to have two redemptions. Once redeemed, collectors will receive a random player from the list below. 2011 BOWMAN PLATINUM HOBBY BASEBALL BOX....HARPER-MACHADO AUTO ? 2011 BOWMAN PLATINUM HOBBY BASEBALL BOX - HARPER AUTO ? 2011 BOWMAN PLATINUM HOBBY BASEBALL BOX - HARPER AUTOGRAPH ? 2011 BOWMAN PLATINUM HOBBY BASEBALL -3 BOX LOT (9 AUTOS - HARPER MACHADO AUTO ?